Black Funeral was previously known as Sorath. Formed in 1993 by industrial musician and occult/chaos magic author Michael Ford (aka Drakkheim Abaddon Nachttoter), Black Funeral was one of the first seminal cult black metal bands in America. Inspired by early Bathory, Von, Hellhammer, early Emperor, Darkthrone, Mayhem and Burzum, “Journey’s into Horizon’s Lost” was recorded and distributed everywhere possible. The recordings ugliness, bad production and extreme sound placed Black Funeral as one of the most chaotic black metal bands in the USA. Musically Black Funeral was a cold and raw mix of black and deathlike metal, always ugly and harsh. It was the intention of Black Funeral to oppose common perceptions of black metal from 1993-1996, to challenge and confront. 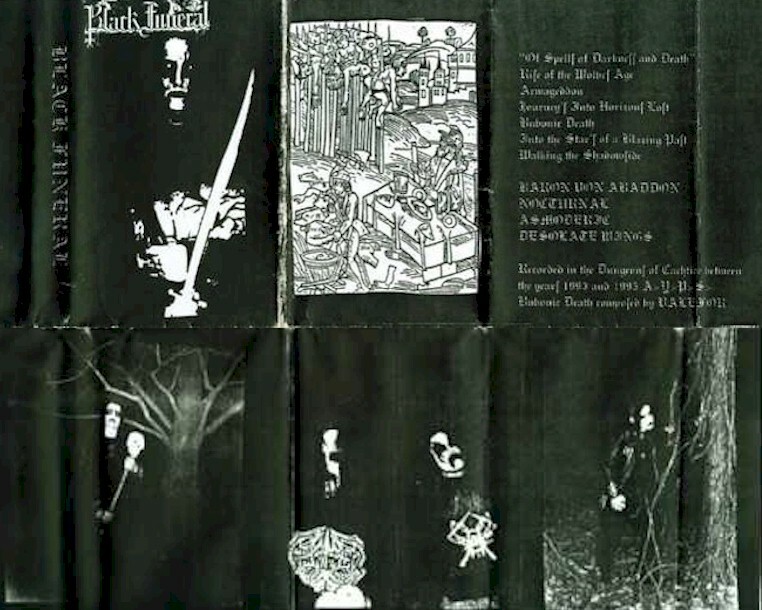 Black Funeral released “Spells of Darkness and Death” as a limited demo in 1995, as well as releasing their debut cd “Vampyr – Throne of the Beast” on Fullmoon Productions of Florida. Need info on the covers. Xeroxed covers. Regular Tapes. First recording features rare vocal style not used on later recordings. Cover features a photo of woods in Indiana, the then - residence of the band. Features all session members except for Michael Ford, then known as Baron Drakkheim Abaddon, Der Nachttoter. There were three versions: The color cover version was authorized by a Bulgarian small cassette label to issue in 1994, however the label only sent an example to the band - published the covers and vanished.